Tootill ABC are not having a show this season due to our founder Alan Robinson passing away earlier this year, and also because we have only being open since late 2010 . I (Michelle Robinson) personally have had a lot to learn with running a non-profit organisation (and I am still learning). It was hard enough for me to fight personal battles but Alan helped me do this. In return I started to help Alan out. The foundations of the gym were already done when I started to help out, and my partner was and is a coach. Me and David spent many weekends and nights down the gym tidying, cleaning, putting shelves together, moving the ring, fixing things, bagging rubbish – you would be surprised how many hours do go into the making of the gym itself. There is still a lot of work to be done and we are going to be working with Derek Booth (Direct Carpets) and others to get this work completed. The paperwork side of it has been very hard work, but I owe special thanks to Gordon French, Debbie Weaver, Margaret Girvan, Victoria Tiffin, Karen Best, Laura Agar (Cavos), Laura Sargent, Danielle Roberts, and Tracy Walker to name a few for there help and guidance, and also my personal friends who have helped me through the hard times, especially after I lost my partner in crime, Alan. I could name you all but I would feel highly offended if I left anyone out. A special thank you to our coaches, David Cook and Brian Robinson, without them the lads would not be able to train, also special thanks to Rob Robinson, Wayne Chapman, Joe Davidson and Adam Athey for helping with training sessions. The last few months have been up and down, but at the end of the day seeing our lads lifting those trophies, or even coming to the gym to show their interest in boxing and sport is so amazing and so worthwhile. I keep telling you all that we do not get paid, and we do this out the goodness of our hearts, and this is all true and correct. It’s one big hobby to us. So when you do see the photos and follow our lads on Tootill, please bare this in mind. Because I have learned not everyone can believe what we are doing is for FREE, everyone penny received goes into the club, any questions from anyone……….. receipts and books can be seen. 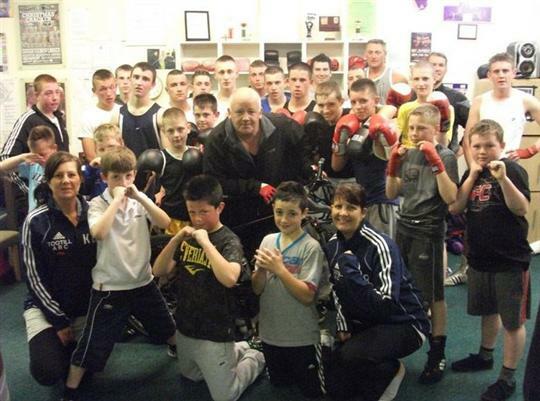 The ‘thank yous’ could really go on for ever, but the more we work together as a community, the better service we can provide to help our boxers and keep fitters, and above all Alan wanted to help keep the children off the streets, to give them a interest in sport, health and fitness. Before I do go we would really like to THANK THE LADS for coming to the classes and working so hard to get to where they are today !!! WE AND YOU have all put a lot of work – hard work – into getting the gym up, running and publicised. Also a very big thank you to Kevin Bostock from Trimdon Village who recently completed a coast to coast bike ride, and has raised approx £700 for Tootill ABC. THANK YOU FOR YOUR PATIENCE AND SUPPORT BUT ABOVE ALL YOUR HELP !! !